Miniature zebu cattle are a diminutive form of the Indian zebu, Bos indicus. At Liar’s Lake we purchased our first miniature zebu bull in the fall of 1985. This beautiful 34 inch bull whom we named Liar’s Lake Petronius (after a Robert Heinlein character) was from the famous herd of Dallas Rhone in Cozad, Nebraska, one of the pioneer’s of the breed. This was the beginning of our thirty plus year association with these fascinating miniatures. In 1991 we joined as a founding member the International Miniature Zebu Association http://www.imza.name and have registered our stock with them ever since. The markets for miniature animals keeps increasing from year to year. They are especially popular with the the hobby farm market as their compact size and gentle nature appeals to the small homesteader. Zebu cattle have a thoracic hump, located above the shoulders. It is large in the bulls, often very erect and tall in relation to the back. Although a cow may possess a hump it is usually underdeveloped in comparison to the bull. Most zebu are horned, with small, short horns growing in most any direction. They can also be polled (hornless) or artifically dehorned by their owners. Obviously the terminology ‘miniature’ denotes an animal that is smaller than what would be considered normal for that species. Through selective cross breeding traditional zebu have been reduced in size until some of the individuals are less than a yard in height. The breed standard for the IMZA allows a maximum height of 42 inches measured behind the hump. Gray to white is the predominant color in zebus large and small. There are a number of different colors available on the current market, including red, brown and black as well of spotted combinations of these colors. The shades of each color vary tremendously with each individual from very dark to very light. Calves are usually born white or red and tend to turn gray as they mature. As the animal ages they often lighten to almost white, sometimes white with black points on the legs, neck and hump. Feed – All cattle, are herbivores that graze mainly on grass and occasionally will browse if given the opportunity. They can be supplemented with grain, and pellets especially in the winter months, but their basic diet is grazing or a good quality hay. As with all animals zebu should be provided with a constant source of fresh, clean water. The amount of volume that an adult animal will consume varies according to its size, the time of year and the condition of the animal. Overall cattle will generally eat approximately 2.5% of their body weight per day in dry matter. The owner should check with the local extension or veterinarian to check for toxic plants and selenium levels in their area. 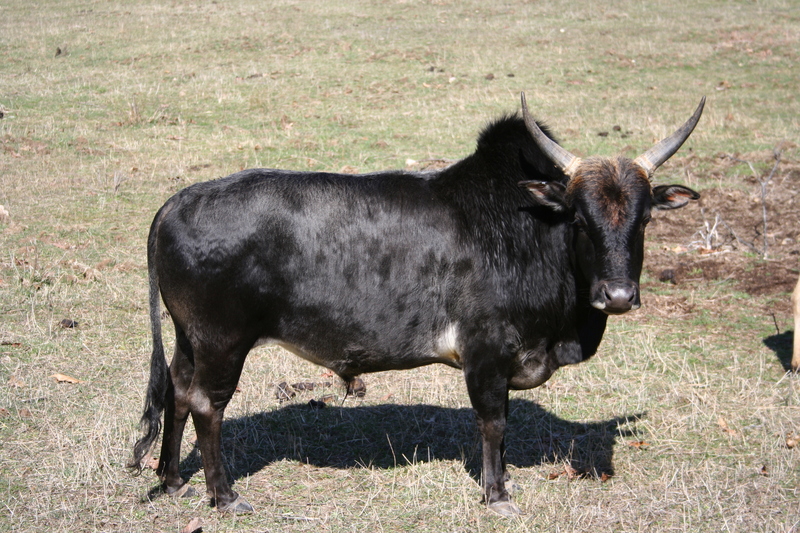 Zebu have a tendency to become obese. Too high a body fat index will effect the reproduction success with your animal, so be careful with the treats and grain. Minerals and salts – Cattle have a need for salt and mineral products based upon the area of the country they are in and the quality of the feed they are being provided. Loose, free choice minerals supplements should be available to help bridge gaps that your regular forage may be lacking. Salt blocks should be placed in a convenient place in the enclosures to give easy access. Shelter – Cattle are hardy and do not require a great deal of shelter. It is always best to provide some sort of location for the herd to get out of the sun on a hot day and out of the wind. Zebu are very hardy and temperature tolerant, but a shelter should be provided against severe winter wind chills and summer heat. Keep in mind that the zebu is a tropical breed, more designed for hot summer weather and more susceptible to winters’ harshness, so shelter from the cold is more important. Vaccinations – Necessary vaccinations vary from location to location, so your veterinarian or local feed store should be consulted when a new herd is established to make certain that you cover the most important dangers. Water – Fresh, clean water must be available at all times. Pay particular attention in the winter to provide available, unfrozen water. Worming – All cattle should be wormed at least every six months. The brands of medication should be rotated with some regularity. Products are available in injectable, drench, edible to be mixed in feed or pour on form. Percentage – There are presently no new percentage animals being accepted for registration. On papers for animals registered prior to April 1, 1995 when the percentage classification was open females of ½ to 7/8 zebu blood were accepted. At what age should you replace your bull to keep reproduction up? I own a 3 year old nebu cow. Please tell me what the average body temperature for a cow and if we want to breed her what temperature would she be. We thought we would monitor her body temperatures for a month.